Back in November, I blogged about planning for company. My cousin was coming to visit and I was so excited that I planned a gourmet lunch for the two of us. I think it is safe to say that my cousin's visit was a truly historical event. In our lunch conversation, she brought up the blog where I had written about some of our ancestors and she expressed interest in seeing the sources of my information. I have a special section in our basement storage area for historical data and had pictures and documents filed in a box and soon it was on my kitchen table with us pouring over it. My Great Grandfather, Fred Kiechel. 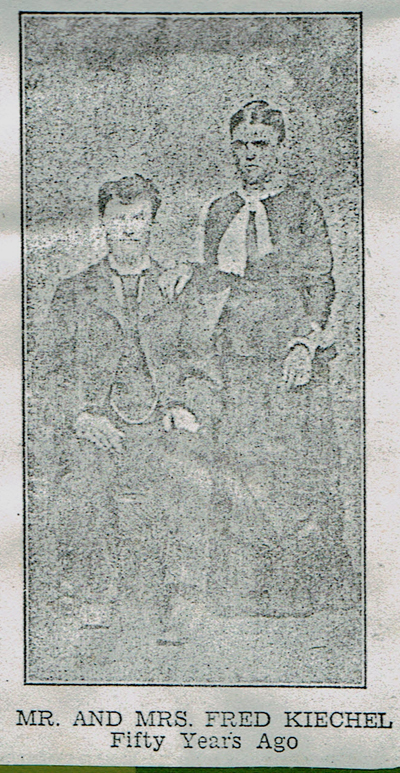 My cousin and I had a great time rummaging through my father's collection of pictures of our ancestors, various assorted documents, newspaper articles, letters, and even my grandmother's autograph book, but what grabbed our attention most that afternoon was a copy of a newspaper article about our great grandparent's fiftieth wedding anniversary celebration! It was a very long and detailed article published in the Nemaha County newspaper in 1929. Reading it together, and piecing the other bits of information we gathered about our great grandparents, we truly felt like we got to better know them, but especially our great grandfather, Fred Kiechel. We initially giggled at the apparent irony of the article, for although he was described as too humble and modest to address all that had come to help celebrate this glorious event, he wrote a special piece that he had his son, Walter, read to all the gathered guests. He spared no detail in expressing his pride in he and his wife's accomplishments during their fifty years of marriage. 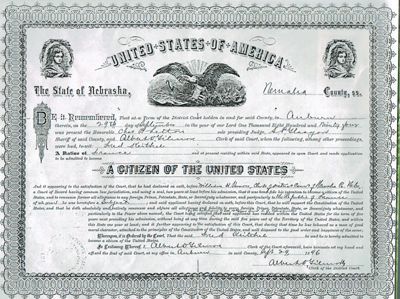 Certificate of Marriage for Frederick Kiechel and Alvina Donze Feb 2, 1879. Picture from the Nemaha Country Herald February 8,1929. 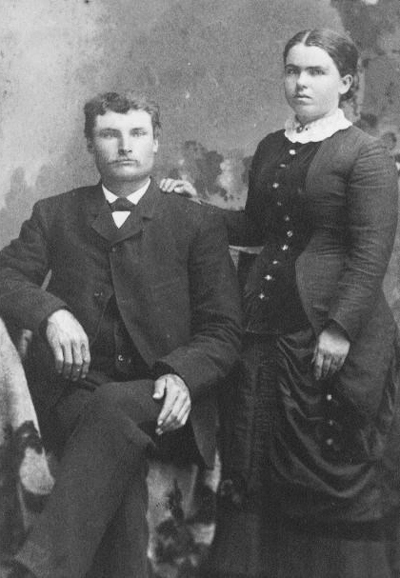 Married 1879. Fred was quite clear that he and his wife and children had played a significant role in being one of the founding families of their community! With language, that in today's standard would be described as no less than theatrical, he told of he and his wife's raising of their children by their example instead of words and wrote of his principles which guided his life in terms that were anything but modest or humble. I was later to learn that Fred was a gifted linguist, speaking fluent German, French and English. This article went on to tell about who sang and performed for this event, as well as descriptions of the decorations and what was served. It even listed all of the guests that attended. 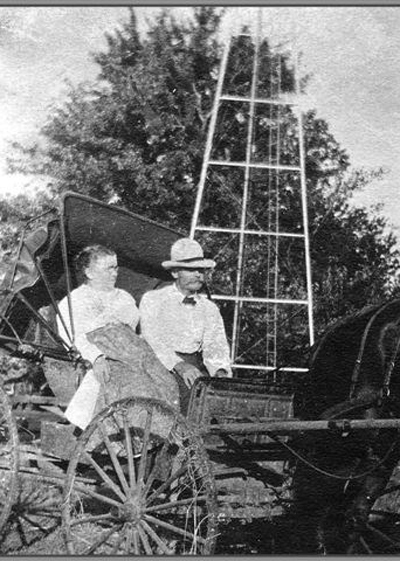 It must have been quite a splendid time for the family and friends of this rural Nebraskan couple and its report was anything but dull reading! According to Fred, he had waited for this glorious event to express his deepest feelings. While his French/German culture was known for keeping such thoughts "close to the chest", I had to doubt whether Fred ever kept much to himself. It was evident from my father's collections of Fred's writings, that he enjoyed good stories and enjoyed telling them as well! I could only imagine that he didn't miss any noteworthy or historical event and was diligent about recording his thoughts and memories for posterity as well as for sharing in their local paper. My father had copies of several of his columns, "Reminiscences of Pioneer Days". It seemed he was no amateur writer! 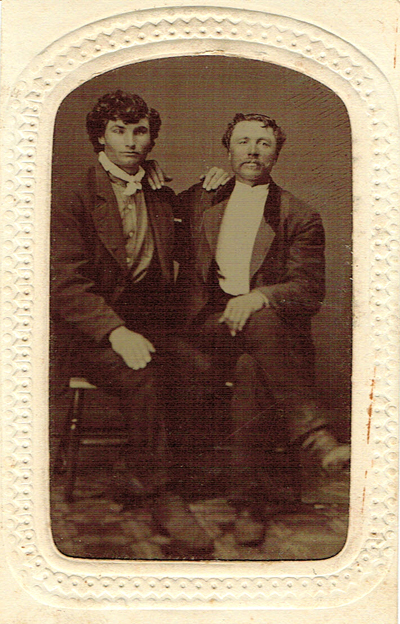 A great old tintype picture of Fred Kiechel (left). In one article he told about the local "lynching" of a citizen of their town. He used the word lynching rather than execution though his article described a person that was legally tried and convicted and according to Fred, deserving of the death penalty, which in those days was done by hanging. There was another article about how he, his mother and siblings, along with his maternal grandparents immigrated to America from Alsace Lorraine. His mother was newly widowed with small children and later remarried. It seems that this is how Fred went from being born a Sturm to becoming a Kiechel, having been adopted by his step-father. I liked Fred, and as my cousin and I read on, and pieced the various details of his life together, the more real he became. Days later I was still thinking of him. Perhaps Fred's life wasn't much different than my own? Taking notes of the events around him, I think he realized he was living the history of future generations. Fred might have led a simple life but his attention to detail in his future stories demonstrated that he was living his life in large ways! 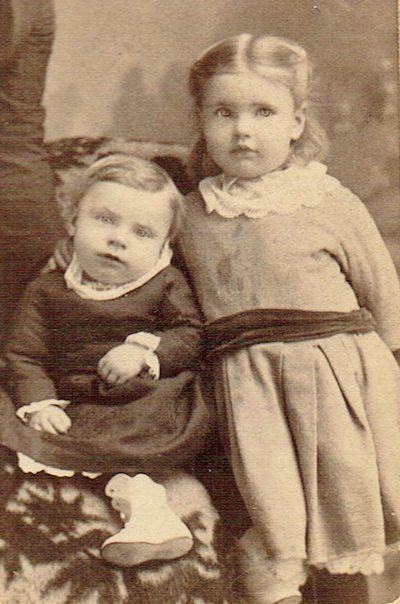 Likely Vina (Emma Alvina) Donze and her brother, Charles. When I was young, I had heard my mother tell the story that when Fred was playing with his first- born son, the child's head accidentally bumped on a piece of furniture close by, leaving him injured and as a result, he died at age four. 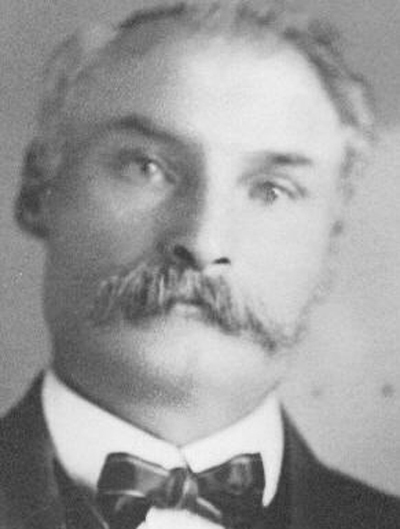 My grandmother was born the year that he died and she was named Addie Rose, having the same initials as her deceased older brother, Albert Robert. My cousin's knowledge and mine seemed to mesh, much like working a jig-saw puzzle that all starts to fit together. Fred's heart, no doubt grew in love through tragedy and grief, as well as hard work, good fortune and blessings. His pride in his accomplishments as well as his reported humbleness made more sense to me as I better understood this duality in his life. Like many, Fred's life had both joy and sadness. He took himself seriously and wrote stern words in my grandmother's autograph book when she was but a young girl, telling her that she "needed to take great care to never shame the family", though, if I have the story straight, he likely lived with regret about the accident with his first son. His life continued just as each of ours does, no matter how sad we might be about something that we have done, or not done. He lived with this loss for the rest of his long life and no doubt it changed him in many ways, just as significant events change us. The facts written in great detail by himself and others indicated that he worked hard to be all he could be for his family and his community and was "a very God-fearing man" and raised his children accordingly. His emotional words bespoke of the sincere and earnest way he approached his life, including his challenges. This anniversary article bespoke of the best of his life and what he and his wife had accomplished. I gave much thought to how they both moved on with their lives, despite the loss of their son. He did write of his love of his wife and his family and he indeed had much to be proud about. My grandmother and her three brothers, were all raised to be "upstanding pillars of their communities". I say, "Good for Fred! "...he really is a mixture of what is most human as well as what is most noble and good. He lived well and clearly this article along with his writings gave his descendants a lovely summary of he and his wife's life. His story demonstrates much strength, making peace and accepting what they couldn't change, and living their lives to the best of their abilities. 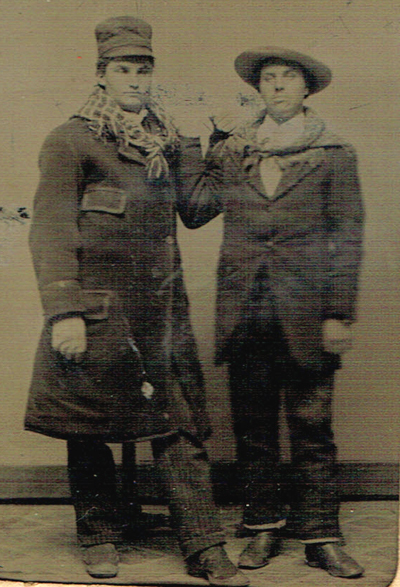 This old tin type picture adds credence to Fred's stories of early pioneer days. My cousin and I laughed and enjoyed our great grandfather's colorful writings that revealed all that was so likable about him. We had a wonderful afternoon getting to know him. "Thank you Fred! We enjoyed spending the afternoon with you and what is more important, is you left us memories of your life that made us reflect on our own lives and appreciate our common humanity. You also made us aware of how important it is that we record bits about our own lives so that one day our future ancestors can know us better and smile, knowing that they didn't fall far from the tree!" I thank my cousin whose perspective and depth always "adds" insights into my learning. I will in the future post some of Fred's writings so my readers may smile and laugh as we did. His use of language is anything but boring, no matter who he is related to! Following this fun day, my family decided to surprise me with a six month subscription to ancestry.com for Christmas. It is the complete membership that includes world-wide searches as well those in the United States, so there is more fun to come, and "Yes,Veronica, I am finding all sorts of new information out about my family and chuckling with my husband comparing each side." It takes all kinds and guaranteed our ancestral tree seems to have a full variety of fruits*!! (* If you haven't already, please read the story about attending a friend's mother's funeral and the priest referring to my friend as one of her mother's fruits." We still laugh about her being a fruit, but aren't we all?!! You can't deny it...I have it on good authority that many of you confessed to being a fruit when you entered my "fruit pincushion contest" in May of 2014!) See http://littlehousehomearts.blogspot.com/2014/05/my-free-fruit-pincushion-give-away-this.html. Labels: Ancestor's legacies. We don't fall far from the tree, Ancestry.com. Family Trees, except occasionally!